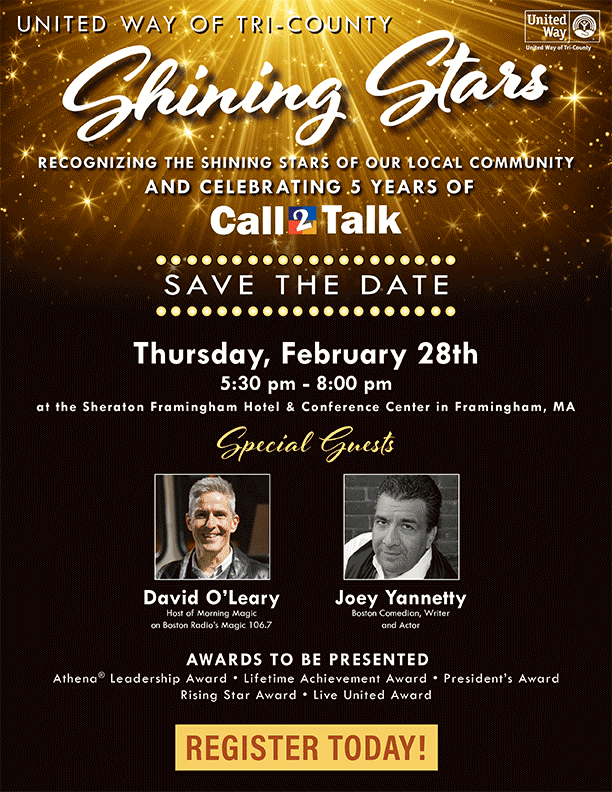 MetroWest, MA – In honor of those who have given back to the local community, the United Way of Tri-County (UWTC) is holding its first Shining Stars Award Celebration dinner and fundraiser on Thursday, February 28, 2019 at the Sheraton Framingham Hotel & Conference Center. The evening will begin with a cocktail reception at 5:30pm with dinner, awards, and entertainment to follow from 6:00-8:00pm. UWTC is moving away from their annual recognition breakfast where, in past years, over 150 awards were given to honor worthy individuals and companies. Instead, they are taking the show on the road beginning in 2019 when UWTC’s President & CEO, along with board members and staff, will recognize individuals, organizations, and businesses at their workplaces, where more employees can participate and be acknowledged for their ongoing support and volunteerism. During the Shining Stars Award Celebration, just ten awards will be presented to local companies, volunteers and donors for their contributions in raising awareness and understanding of the United Way mission, and for their efforts in volunteerism, outstanding dedication, service, leadership, and achievement. This celebration also comes just as UWTC’s Call2Talk mental health, emotional support, and suicide prevention program is celebrating its fifth anniversary. Framingham’s own award-winning morning radio show host David O’Leary from Magic 106.7 will act as Master of Ceremonies. O’Leary is very active in the local non-profit community, giving his time and talents to many deserving organizations including the American Foundation for Suicide Prevention and the United Way of Tri-County. In addition to dinner and awards, entertainment will be provided by Boston comedian Joe Yannetty. Like most native East Bostonians, he’s hilarious. He was raised in an inner-city Italian neighborhood, which means that being funny is not only a survival skill, it is in his blood. Joe loves entertaining for non-profits doing good things in the world and enjoys giving back. During the evening’s program the winner of the 2019 Athena Leadership Award ® will also be announced. This annual award is presented to a prominent leader in the MetroWest region for contributing to the advancement of the status of women in the community and the workplace, achievement of professional excellence, meaningful contribution to community service, and active assistance to women in their attainment of professional and leadership skills. Nine remarkable women were nominated for this significant award. There will also be a special segment highlighting Call2Talk’s evolution and service delivery over the last five years and its rapid growth both locally and statewide. This is a not-to-be missed evening and tickets can be purchased on UWTC’s website at www.uwotc.org/stars. Call2Talk, a direct service of the United Way of Tri-County, is a confidential mental health and emotional support call line that assists individuals and families through stressful times in their lives. Call2Talk’s well trained call-takers offer compassionate, non-judgmental, emotional support to our callers in need. We partner with Crisis Text Line 24/7, providing access to texting services with the same level of support and information. Call2Talk also offers TeleCheck, a phone check-in service for isolated seniors who are experiencing the onset of a sudden life change and recently launched the MetroWest LOSSteam working with six local police departments to offer immediate on site peer emotional support to suicide loss survivors. The ATHENA Leadership Award was inspired by the goddess of Greek mythology known for her strength, courage, wisdom and enlightenment – qualities embodied in the ATHENA Leadership Model. The Award is unique in both scope—local, national and international–and the ATHENA mission upon which it is based. The ATHENA Leadership Award is presented to a woman —or man— who is honored for professional excellence, community service and for actively assisting women in their attainment of professional excellence and leadership skills. The United Way of Tri-County is a community-building organization that brings people together to care for one another. We provide programs and services, connect volunteers, strengthen agencies, teach social responsibility, and meet the critical needs of the community with the help of people like you. For more information visit UWTC’s website at www.uwotc.org.